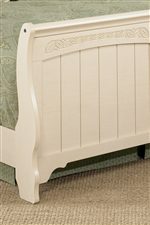 This sweet poster bed features a cream cottage painted look, bun feet, and country styling. Incorporate this bed into your home as a versatile piece that can be used in an adult or child’s bedroom. 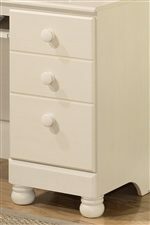 Optional drawer storage or a trundle panel are available to add functionality to the beautiful look of this bed. This bed is available in twin, full, and queen sizes. The Cottage Retreat Queen Size Poster Bed by Signature Design by Ashley at AHFA in the area. Product availability may vary. Contact us for the most current availability on this product. B213-57N Queen/Full Poster Headboard 1 64" 4" 56"
B213-54N Queen/Full Poster Footboard 1 65" 4" 31"
Finish Replicated light cream paint with subtle replicated brushing. Case Detail Bun feet on cases and beds. Graphic leaf design pattern on horizontal rails. Arched top drawers. Bead board panels on headboards and footboards. 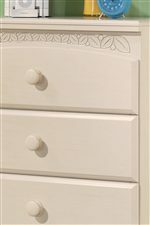 The Cottage Retreat Collection has a cream cottage painted finish look. The bun feet on cases and beds, graphic leaf design pattern on horizontal rails, and arched top drawers add authentic cottage elements. This bedroom group has the versatility of being adult or youth. The "Cottage Retreat" bedroom collection brings beautiful detailing and soft country styling together to create the perfect bedroom collection. The Cottage Retreat collection is a great option if you are looking for Cottage furniture in the area.